We’d never had much luck with catching trains from Bologna, in the heart of Italy’s food valley of Emilia Romagna. The history of my texts with a friend in Bologna exposes a litany of face-palm emojis. It had become an in-joke between us now. The train system in Italy is excellent when it works. All too often, as we’ve gone to the train station to do a day trip from Bologna, it’s been a heaving throng of sweaty-faced people, pushing and shoving their way around the entry area. Train workers love to strike, and when they do so, it creates maximum impact on train lines and timetables all over the country. As we walked to the Bologna Centrale train station under the protection of the ancient porticoes, we lightheartedly joke about what kind of delay we might face. We’ve decided to catch the train from Bologna to Ferrara, a simple 30-minute journey. Holding our breath, we arrive at the station and glance skywards to the departures board. Hooray, instead of the board being lit up with that word that travellers hate, “delay”, it looks like it is all systems go for our day trip to Ferrara. Today, we can finally put the face-palm emojis to rest. In the Emilia Romagna region, visitors are spoilt for choice. There are so many wonderful cities and areas to explore, and many of them are well connected by the road and rail network. Rail travel, notwithstanding the issues above, is efficient and inexpensive. Bologna, the capital, is the largest city in the region and the most popular, for good reason. We have spent several weeks there and I can honestly say that it wouldn’t be hard to return. From Bologna, however, the more well-known cities to visit are Venice and Milan in the north, San Marino to the east, and Florence to the south. All are within easy reach of Bologna. Approximately 50 kilometres north-north-east of Bologna is the town of Ferrara. A medieval city that was once completely walled, it remains a bit of a hidden secret to visitors to Bologna. The lack of tourist rush adds to the appeal but I can’t help but think that this is one city that shouldn’t be missed. It’s a 20-minute walk from the Ferrara train station to the centre of town, but it’s a walk we know we must take. Firstly, it allows us to see what the town is like outside of the historical centre and secondly, they don’t call Emilia Romagna the food valley for no reason. We’ve been eating and drinking our way through many small towns and villages, and exercise is most definitely needed. The walk is easy enough. Following the road directly across the road from the station (Viale Cavour), passing the main football stadium as you go. The inner city streets are made from round stones and are not the easiest to walk on. They resemble the Roman roads of yesterday and without actually knowing their age, I imagine them to be quite old. There’s no denying we’ve arrived at the centre of the city. Ahead of us, the gargantuan red-brick building rises before us and takes centre stage. The Estense Castello, once the home and palace of the Este family, is both incredible and bland at the same time. Italy was once comprised of city-states. The large cities became the points of control, and the regional areas around them, part of the state. Important, noble families with names like Medici (Florence) and Sforza (Milan) came to rule many of these city-states. The pope, who ruled the Catholic Church, also ruled the Rome city-state. Some were run by the city itself, via elected members. It created an environment for aggression but also for great economic and cultural improvements. Perhaps artists like Michelangelo and Da Vinci may not have fared as well, were it not for the philanthropy of the Medicis. In Ferrara, the Este family ruled from the 12th to the 15th century. Initially, they lived in a more modest looking castle, but as discontent grew in the late 1300s as a result of tax increases by the family, the palace was fortified. With four towers, a moat and drawbridge, it would have taken a significant attack to break through these walls. It remains fully intact, with the moat also still in place. Any moment I was expecting a knight, covered in shiny armour to come bursting over the drawbridge, armed with a joust. The red brick of the castle can be found all over Ferrara. These bricks, developed by the Romans, were used extensively during the Middle Ages and spread throughout many parts of Europe. The walls of Ferrara city are also built from the same red bricks. For the most accurate information of the castle’s opening times, ticket prices etc, it’s always best to check the official website. The main square in Ferrara, Piazza Trento, is not far from the castle and is the liveliest part of town. Flanked by the San Giorgio Cathedral and the Ferrara City Hall, it’s a place to catch up with friends at one of the many bars and cafes. Like any major town square in Europe, prices are always going to be higher, and sometimes quality suffers, but it is a fantastic spot to stop and watch the world go by. 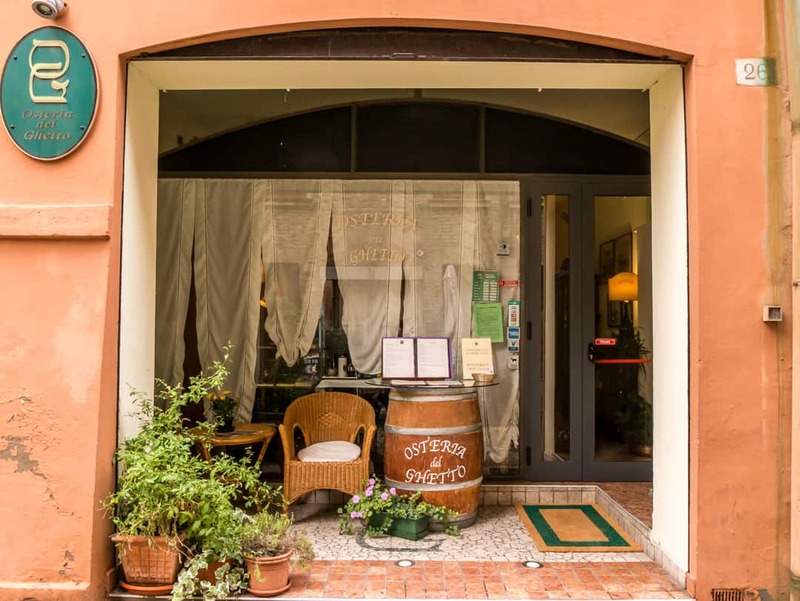 Leon d’Oro, a stalwart of 40 years on the Piazza Trento is as good a place as any to stop for a break. Located underneath the city hall, you can find many cakes, pastries and biscuits that are unique to Ferrara. The city hall features the Este family, through statues of Niccolo III, the most notorious member of the family and his son. Taking pride of place on the piazza and directly across from the Ferrara City Hall is the San Giorgio Cathedral. The cathedral is known to be impressive from an architectural perspective, specifically due to its blend of Romanesque and Gothic styles. Whilst the front of the church was finished in marble, the sides were left unfinished. The lower part of the church was completed in the 12th century, and the upper part in later times, hence the different styles. Unfortunately, we couldn’t get a clear image of the front of the cathedral as it was under full scaffold when we visited. Even from the side, it’s a beautiful looking building, and I just loved all of the stores tucked beneath the terracotta tiled rooflines on the ground level. There’s nothing I love more than a walled city and we’ve been fortunate enough to see some spectacular ones in our travels. I think Carcassonne in France and Tallinn in Estonia are hands-down my favourites. The city walls of Ferrara are intact which is also quite unusual, given both the age and the constant procession of wars and disturbances in and around this city since its inception. Thankfully, the city of Ferrara is now UNESCO protected, meaning these walls and everything else inside will continue to be around for generations to come. Unlike some of the smaller walled cities however, these walls are a little further out. It’s easy enough to get to them, however, and Ferrara is built for riding bicycles, with over 85 kilometres of cycle paths, including a 9-kilometre track that circumnavigates the city walls. The terrain is flat and the locals adopted this as a favoured form of transport a long time ago, with around 25% of them using bikes. It’s also one of the reasons why Ferrara does not have high numbers of vehicles. The Old Town of Ferrara is also a pedestrianised zone. There was never any doubt we were going to strike it rich in the food department in Ferrara. Like most Italian towns and regions, they have their own specialties. They twist and turn traditional pasta recipes ever so slightly to create their own version that you won’t find anywhere else in Italy. Take the cappellacci for example. To the uninitiated, it will look like ravioli. The thing about non-Italians is that we tend to group pasta into several main categories, never really looking for or caring about slight differences. Not so in Italy. It can actually be quite offensive to someone who has cooked the pasta to have it mistaken for something more mainstream. Ferrara is also known for Pasticcio Ferrarese, which is a macaroni pie and Salama da sugo, a local pork sausage. Wanting to find somewhere as authentic as possible, we walked down Via Giuseppe Mazzini, the main street that leads away from the Piazza Trento and the cathedral. Now a shopping street there’s plenty to keep you occupied along here, including bars and restaurants. The restaurants here are definitely amped up to secure the tourist trade with touts on point out the front of most of them, encouraging you to come in. We got off the main strip and found ourselves in the Jewish quarter. The existence of Jews here goes back to around the 13th century, where they were encouraged by the Este family. It seemed right then that we would happen upon the Osteria del Ghetto. The front door and entrance doesn’t exactly make itself known. We struggled for a while to understand whether they were in fact open. We walk through a room that makes us feel as though we are sneaking into Nonna’s home, up a set of stairs to the upper level. Now it feels as though we are in the correct place. There’s nothing fancy about this restaurant. Owned by a former teacher, she runs this place with a firm hand. Young staff members are permitted to take our order but it is she who must deliver the meal to the table. We order the cappellacci, both traditional, with the ragu sauce and one with a butter and sage sauce which were both equally delicious. We wash it down with Lambrusco. It’s the perfect way to enjoy traditional local fare. The less traditional way of serving cappellacci – filled with pumpkin served in butter and sage sauce. Italy is also known for gelato and it’s never too hard to find someone willing to serve up this ice-cold treat. It’s important to only buy good quality, artisanal gelato though. Read more>> Our visit to the Gelato Museum and how to know you are eating authentic Italian gelato. For our recommended place to buy gelato, you need to walk out of the city centre a little and onto the opposite side of the castle. Here you will find La Romana Ferrara, home to some of the best gelato in Ferrara. I got to try my first ruby chocolate concoction here. All gelato is made on site and if you are lucky you can see them hard at their craft through the windows in the front of the store. We didn’t stay in Ferrara but there are many hotels and other forms of accommodation to choose from. Check out Trip Advisor for locations, reviews, prices and availability. Ferrara is easily reached by train, with the train station approximately 20 minutes walk from the centre of town. Alternatively, you can use taxis. The train line connects Venice and Bologna. The train takes approximately 30 minutes from Bologna and 1.5 hours from Venice. Local buses also operate from the Ferrara train station. If driving from Bologna, take the A13 Autostrada Bologna-Padova and take the Ferrara exit. This takes approximately 45 minutes and there are several parking areas within the city. There is so much more to see and do in Ferrara but these are the best places to spend your time if you only have a short time in the city. Ferrara is full of beautiful churches and plenty of museums, something we avoid but you may not. Sign up (for free) to our free trip planner and create your own itineraries for Ferrara and other cities. By signing up, you can save your itineraries and keep coming back to them.